The NFB BELL Program is designed to provide intensive Braille instruction to blind and low vision children during the summer months. This program is meant to serve students who are not currently receiving enough Braille instruction in school or who could benefit from Braille enrichment over the summer. This program is modeled after the successful 2008 BELL Program led by the NFB of Maryland. Nineteen affiliates — California, Colorado, Florida, Georgia, Idaho, Illinois, Louisiana, Massachusetts, Maryland, Mississippi, North Carolina, New Mexico, Ohio, Oklahoma, Pennsylvania, Tennessee, Texas, Utah, and Virginia — hosted the NFB BELL Program in the summer of 2013. Text BRAILLE to 41444 to pledge a gift! 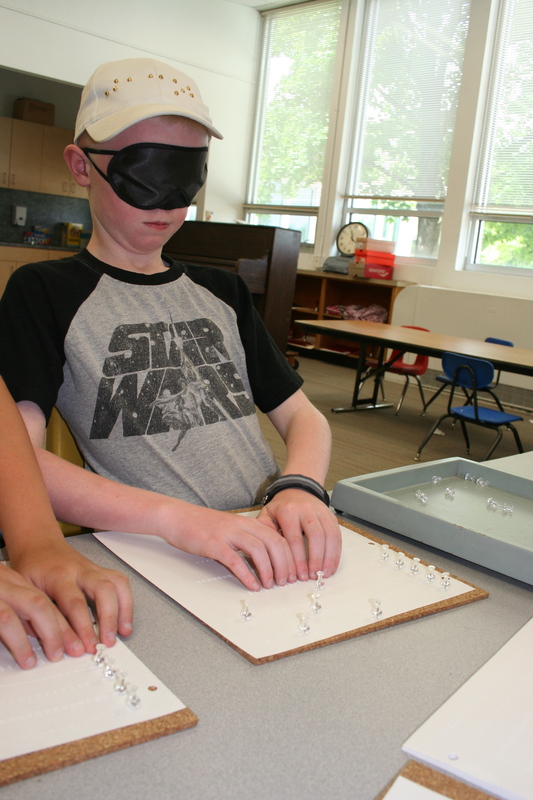 We need your help to ensure blind and low-vision children, like those in your life, have access to much-needed Braille enrichment in the summer of 2013 and beyond! The goal of this program is to provide children ages 4-12 with two weeks of intense Braille instruction through fun, hands-on learning activities. The program will target blind and low vision children who are not currently receiving enough Braille instruction in school or who could benefit from Braille enrichment over the summer. The program is designed to run Monday through Friday for six hours a day. In addition to Braille crafts, games, and other engaging projects, children may also enjoy field trips to sites related to the NFB BELL curriculum. How are lunches handled for the NFB BELL program in Idaho? The Boise program is able to provide snacks and lunch. In the Idaho Falls program will provide snacks. However, students should bring a lunch. For each location, parents provide transportation. If parent transportation is prohibitively difficult, contact coordinator who will help with other arrangements. What is the registration fee for the NFB BELL program in Idaho? Registration for the Boise program is $25. Registration for the Idaho Falls program is $4.25. Who should I contact if I have questions about the NFB BELL program in Idaho? Mail: 7300 Highland Valley Rd.